When President Obama and African heads of state and government convene in Washington, DC next week for the first-ever U.S.-African Leaders Summit, they will focus on "investing in the next generation". No theme could be more relevant to the future of sustainable development across the continent. Today's generation of young people – not only in Africa but worldwide – is the largest in history. Sheer force of numbers means that we urgently need to harness the power and creativity of youth on every continent, from the Americas to the Middle East and Asia. In Africa, that need arises with particular urgency. As I wrote in my open letter to African Union leaders before their summit in June, there sometimes seem to be two Africas: one is a new land of opportunities, the other a poor, hungry and hopeless place. But in fact, Africa is rich in resources, and its people are the greatest resource of all – especially the 200 million Africans between the ages of 15 and 24. Each year at least 10 million young people, more than ever before, enter the labour force on the continent. Yet tens of millions of young Africans remain unemployed. Many who have jobs are trapped in poorly paid or part-time work, leaving their vast potential underutilized and untapped. At IFAD, we know from experience that young people are the most precious resource a rural community can have. Today, however, many rural areas in Africa are losing their young people, because there are often so few incentives for them to stay. When young rural women and men cannot get an adequate education, make a living or create a secure home, they move to sprawling cities or to foreign countries that, they believe, offer more hope. Some make good and contribute to their communities by sending money home. Too many others become mired in urban poverty. This is a tremendous loss for their families and their nations. So if we are serious about investing in the next generation in this, the AU Year of Agriculture and Food Security, we must recognize that increased support for agricultural and rural development is essential. How could it be otherwise when some 60 per cent of Africa's people depend wholly or partly on agriculture for their livelihoods? As I noted in my letter to the AU, a thriving small-farm sector helps rural areas retain the young people who would otherwise be driven away. Targeted investments can make a difference. To start with, support for basic education is critical in rural areas where schools are underfunded and poor children are often taken out of school early and put to work. Young rural people also need vocational training, apprenticeships and further education to give them relevant knowledge and skills. An IFAD-funded project in Madagascar, for example, provides apprenticeships and job opportunities for thousands of young rural workers, building a stable, skilled workforce for Malagasy small businesses. In Tanzania, IFAD supports farmer field schools that use experiential learning to help farmers of all ages solve problems and acquire new techniques. Those who apply what they learn are reaping the benefits of higher yields, productivity and profits. Meanwhile, in several West and Central African nations, a regional IFAD grant is providing training and business development services for young women and men involved in farming and other rural enterprises. With help from their mentors, these agricultural entrepreneurs – or “agripreneurs” – are starting up new ventures across the value chain. They are demonstrating that agriculture is an exciting, modern profession through which young people can contribute financially to their communities as both producers and consumers. But education and training alone are not enough to guarantee sustainable livelihoods. Young adults’ access to finance in rural areas is also vital. In Benin, IFAD supports the establishment and growth of financial service associations − owned by rural people − that offer credit and savings products in more than 190 village banks. Nearly half of all the credit extended by these associations has gone to young women and men. When basic education, training and credit are widely available to Africa's young rural people, they seize the opportunity to invest in their own farms and businesses. They are empowered to build their skills and confidence. They participate in community decision-making and assume leadership roles in local organizations. On an even more basic level, investing in Africa's next generation means making nutrition-sensitive agriculture a top priority. 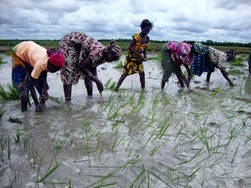 You can't de-link agriculture and nutrition, since up to 80 per cent of the food consumed in Africa is produced locally. 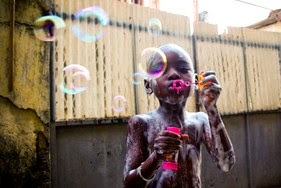 Yet more than 4 in 10 children under the age of five in sub-Saharan Africa are undernourished. Failure to expand, sharpen and accelerate our efforts on nutrition will impose a heavy cost in opportunities missed and potential unmet. One study found that undernutrition in Africa causes economic losses that vary by country from 1.9 to 16.5 per cent of GDP. In addition, governments end up spending billions of dollars on programmes in order to deal with poor nutrition and its effects. Investing in nutrition through agriculture, therefore, is more than a social good. It is sound development policy and good economics. It encompasses partnerships with other sectors, including health, water and sanitation, and education. And it demands careful attention to the social context – notably the status of women – as well as farming practices that protect the environment and foster biodiversity. As African leaders gather for the summit in Washington in a spirit of partnership, it is important to remember that they, in particular, must take the initiative in fulfilling the promise of the continent's next generation. More than a decade ago, their governments pledged to allocate at least 10 per cent of their national budgets to agriculture, yet only a handful of countries in Africa have consistently reached that threshold. Even as they seek responsible, transparent foreign investment to alleviate poverty and boost food security, it is time for African leaders to deliver on their commitments. The next generation deserves nothing less.